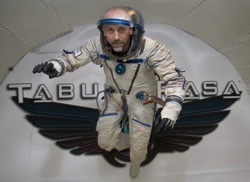 Richard Garriott is a really nice guy, good sense of humour, smart dresser, full of energy – oh, and a multimillionaire award-winning computer games designer, a daring adventurer and also an astronaut. Its all thanks to computer science, creativity and lots of hard work. Richard was born on July 4th, 1961 in Cambridge. His dad was US astronaut Owen Garriott. When he was a kid he worked in a computer shop, and in his spare time he wrote computer games, often giving them away free to his friends. One of his games, called Akalabeth, was different. He managed to get the folk who owned the shop he was working in to buy some ziploc bags and to try and sell it. They sold a few, and one of the bags also made its way into the hands of a computer games company. They were impressed and signed Richard up. Over the next few years Richard, a self-taught computer programmer, developed the legendary Ultima game series. These were classic role-playing games (RPGs) where the players could take on the personas of wizards and warriors. During this time Richard, who now lived in the USA, was called ‘Lord British’, because people thought he had a strong British accent. “After my first publisher started selling my first game in a bigger ziploc bag, they started mailing me $5 per copy they sold,” Richard says. “That first game, which took me a few weeks to create, sold 30,000 units. If you do that math, that is $150,000 for a high school senior’s after school time. Clearly a good idea to continue!” His place in the computer games hall of fame was secured when he moved to the next level and created Ultima Online, the first large-scale commercial ‘massively multi-player online game’ (MMOG). This outsold all previous versions of the Ultima series, won numerous awards, and has a cult following today. He sold his computer games company, but later created another which became NCsoft, an online games publisher. His passion for fantasy computer gaming, computer programming and creativity combined with a good idea and a commercial brain made him very, very rich. What to do next? What would you do if you had all that money? Richard used it to explore his dreams. He has explored the world, from the icy desert of Antarctica to the watery depths of the Titanic. But the world was not enough. His dad had been a spaceman, and Richards’s dreams were to follow him – and to let others follow too. He helped set up Space Adventures, the first commercial spaceflight company, who plan to launch their own space voyages by 2011. The first small step will be a trip to the International Space Station (ISS) in October. Richard will be the sixth so-called ‘space tourist’, paying for his flight and accommodation to spend 10 days aboard the ISS. He will show that companies can make money in space by running some of his own experiments in the microgravity of the space station, the results of which will help develop new drugs to fight disease. But the flight will also involve Richard’s other passion, a passion for science. In the last edition of cs4fn we carried an advert for a UK-wide schools competition to suggest experiments Richard can do in space. There were some brilliant new ideas and Richard will perform the winning suggestion on the ISS. He will also be doing live links to UK schools to discuss his space station experience, and may have a magical trick or two up his space suit sleeve. Richard is also an avid magician and magic collector. He even appeared on the cover of the January 2008 issue of MUM, the magazine of the Society of American Magicians. His interests in magic led him to build a ‘haunted house’ and a magic museum at his home in Austin, Texas. His house is called Britannia Manor, an appropriate home for Lord British. Space can inspire, we all look up at the sky and wonder. It’s scientists, mathematicians and engineers that make our journeys up there possible, along with people like Richard Garriott, who have the passion to make it and take it to the next level. We’ll leave the last word with Richard: "Humanity’s destiny is to explore and live beyond the confines of our mother planet. Exploring and settling in space should not remain exclusively in the hands of governments. If it is valuable, as I believe it is, for humans to live and work in space, then private individuals and companies should be able to build businesses in space that go beyond planting flags and provide real value to humanity. I hope that my participation in this industry will provide at least a small step to achieving that goal!"